Four Seasons at Manalapan by K. Hovnanian is located near the prestigious Battleground Country Club in the heart of Monmouth County in Central New Jersey. Manalapan Township is the perfect location for golfers, history enthusiasts, power shoppers, commuters, and fun seekers. Active retirees will find that this community is close to everything and offers unparalleled luxury with a spectacular community lifestyle. Four Seasons at Manalapan is conveniently located to all major highways in the region. The Jersey Shore, Atlantic City, and Manhattan are all easily accessible by bus, train, or highways. In the immediate vicinity, residents have several malls and shopping centers for everyday necessities. On site, residents can enjoy world-class amenities and a nature preserve. Four Seasons at Manalapan is an age-restricted community that requires at least one occupant be 55 or better and no one under the age of 19 may permanently reside in the community. The magnificent 29,000 square-foot clubhouse is the center of activity at Four Seasons at Manalapan. A cozy lounge and fireplace set the ambiance and welcomes residents into a place of fitness, relaxation, fun, and socialization. Residents can work out in style at the fully equipped fitness center complete with indoor pool. Afterwards, they can make some new friends over a relaxing game of billiards. For fun and arts and crafts galore, the activity rooms provide the space for like-minded individuals to come together. The clubhouse at Four Seasons at Manalapan also offers computers, so residents can stay connected while enjoying life in this fun community. Outdoors, there are two pools, complete with a patio and sundeck. One pool is set aside just for the grandkids. For additional fun and activities there are two tennis courts, bocce ball courts, horseshoe pits, and a playground for the grandkids. Residents can also practice on the putting green in preparation for play on any of the golf courses in the Manalapan Township. Serene walking trails wind through the on-site nature preserve and provide peace and tranquility. Construction of Four Seasons at Manalapan started in 2004 by K. Hovnanian. Upon completion, the community will contain 692 single-family homes. Residences are available on a resale-only basis. K. Hovnanian offers eleven different floor plans; one of them has a loft option. Walkout basements are available on some floor plans as well, but are limited to proper homesites. Homes at Four Seasons at Manalapan offer between two and three bedrooms, two to three baths, and have two-car garages. Residences are spacious and offer between 1,670 and 3,430 square feet of living space. Four Seasons at Manalapan is an exciting 55 and over community that offers a resort-at-home lifestyle in a private and secure setting. A full-time activities director is on hand to plan organized trips and events. Residents are also already in a variety of established clubs, but residents can start additional ones. Some of the existing clubs are golf, book, bocce group, canasta, Scrabble, Mah Jongg, and tennis. No matter what your interests or hobbies are there is something for everyone at Four Seasons at Manalapan. Residents of Four Seasons at Manalapan can shop at the Freehold Raceway Mall or several other malls and shopping centers in the area. One of the main attractions in Manalapan is historic Monmouth Battlefield State Park. Another historic site in Manalapan is Covenhoven House. Sayen House and Gardens is a wonderful botanical retreat in Hamilton, New Jersey and worth a visit. The Mac Kenzie Museum and Library in Howell, New Jersey is a great cultural destination. The Jersey Shore Beaches, Atlantic City, Philadelphia and New York City are all easily accessible from Four Seasons at Manalapan. In addition, Atlantic City, Newark and of course New York City all have international Airports to make long-distance travel very convenient. 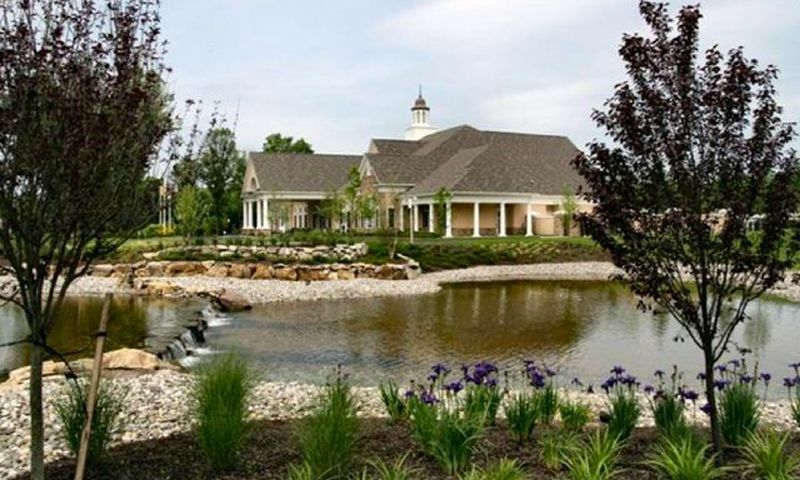 Four Seasons at Manalapan is an ideal active adult community in Central New Jersey. There are plenty of activities available in Four Seasons at Manalapan. Here is a sample of some of the clubs, activities and classes offered here. There are a wide variety of single-family homes that range from 1,670 to 3,430 square feet. Homes feature two to three bedroom, two to three bathrooms and a two-car garage. We moved to Four Seasons Manalapan a few years ago. Before moving here, we visited many other communities. We found that this community had every amenity we wanted, and more. The clubhouse has an indoor pool which is a great feature. There are many clubs to join, if you want, and we found everyone to be so receptive. The upkeep on the grounds and landscaping are perfect. We feel we made a great choice to move here, and it is not just a community, but a lifestyle. This is a wonderful community in Manalapan full of clubs and activities for every interest. We searched high and low for an active adult type community that had big enough homes to accommodate our needs. We wanted the extra space for our kids and grandkids to visit and feel like they had enough space and weren't in a tiny little guest room. Our house has a second floor with a loft, bath and bedroom that we pretty much set-up just for our visitors. It's great because we all have privacy! For us, the home was the main attraction but we found that the clubhouse and all the amenities here are wonderful too. It's a great neighborhood. 55places.com is not affiliated with the developer(s) or homeowners association of Four Seasons at Manalapan. The information you submit is distributed to a 55places.com Partner Agent, who is a licensed real estate agent. The information regarding Four Seasons at Manalapan has not been verified or approved by the developer or homeowners association. Please verify all information prior to purchasing. 55places.com is not responsible for any errors regarding the information displayed on this website.